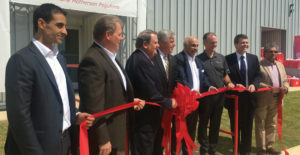 SMP Automotive Systems Chairman Vivek Chaand Sehgal (fifth from the left) joined company, state and local officials in April for the opening of the company’s $150 million plant in Tuscaloosa County. In April 2018, an automotive supplier new to Alabama opened its first plant in the state. Located in Tuscaloosa County and spanning 700,000 square feet, the facility is owned by Samvardhana Motherson Peguform, an Indian company with operations in 41 countries. The new outfit is called SMP Automotive Systems Alabama. In 2015, when SMP executives initially announced their plans to build a $150 million plant in Alabama, they estimated that the factory would employ 650 people. But by the time the plant opened last year, those figures had increased, and the company expects to eventually employ almost 1,200 workers. The new SMP Automotive plant will focus on producing door panels, bumpers, claddings, roof spoilers and running boards for Mercedes-Benz U.S. International, the automaker’s assembly plant just a few miles away. With so many other automakers nearby — including Honda, Hyundai and a new Mazda Toyota plant under construction in Madison County, plus more just over borders in Mississippi, Georgia and Tennessee — SMP will have opportunities to expand its customer base without going very far. The Tuscaloosa County plant continues SMP’s growth plans in North America, where it already has 25 manufacturing facilities in the United States and Mexico. Overall, the company has 230 facilities in 37 countries. The existing Mercedes-Benz plant in Tuscaloosa County is credited with kicking off a lasting, successful automotive industry in Alabama when it opened in 1997. And that plant, the state’s first automotive success, continues to play a role in attracting more automotive employers to the area, including SMP. The supplier was attracted by the Tuscaloosa area’s close proximity to its customer, Mercedes-Benz, but a collaboration of local groups worked together to bring the company to Alabama. In the spring of 2015, the state Department of Commerce and the Tuscaloosa County Industrial Development Authority learned that SMP was selected by Mercedes-Benz U.S. International as a supplier for the automaker’s new SUV platforms, Canfield says. The two organizations worked to develop Project “Black Neutron,” a campaign to locate SMP in Alabama. They worked closely with Andreas Hauser, who was SMP managing director and head of Corporate Office Europe and Americas. Automotive suppliers have become an important engine in the state’s economy. Employment in Alabama’s auto parts manufacturing sector has risen nearly 80 percent in this decade, while employment at the original equipment manufacturers (OEMs) has risen almost 30 percent, according to St. Louis Federal Reserve Bank data. A number of automotive suppliers have located in Alabama in recent years, but SMP’s arrival is especially important because it is classified as a Tier 1 supplier, meaning it supplies parts or systems directly to OEMs. In addition to providing a wide range of career types, Tier 1 suppliers are also known for providing higher wage rates and competitive benefits for their employees, and SMP will be no different, Jones says. Nancy Jackson is a Birmingham-based freelancer for Business Alabama.